- "So you mean", said B with a slightly disturbed but still amused voice, "that if my flag falls in an ending King + Bishop versus King + Bishop, then with bishops of the same color the game is drawn, but with opposite colors, I lose?" - "That's right, same color is insufficient material, you can't construct a sequence of legal moves leading to checkmate." - "Because of that possibility, if my flag falls I have lost the game. That's ridiculous!" T went on with the other endings of one piece each, knight against knight, bishop or rook, bishop against rook (where it turns out the bishop can't win). - "You also lose with a pawn against a piece", he continued, unable to conceal his excitement. - "Aha, because I could promote to a knight or maybe a bishop, and then corner my king. That's the silliest use of under-promotion I've ever heard of!" 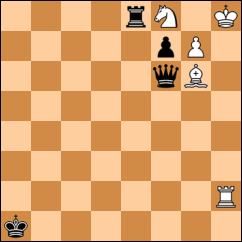 - "In this position, White won with 1. a8R+! Kb4, 2. Rb8+ Kc3 3. Rxb1. If the rook had been a queen, Black would have been stalemated at this point." - "The defensive motive, getting oneself stalemeted, is even more exotic. It's been demonstrated numerous times in problems and studies, like this one by Traxler and Dedrle from 1909:"
- "White draws with 1. Ra2+ Kxa2 2. Bxf7+ Qxf7 3. g8B! 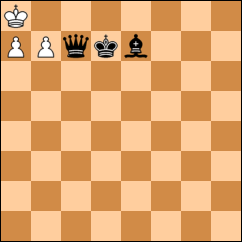 Rxf8 stalemate. But the defensive under-promotion is a unicorn of chess. Easy to imagine, yet nobody has seen a real one! Amazing, isn't it? Not a single defensive under-promotion is known from the millions of recorded games of chess history." - "The most spectacular demonstrations of under-promotion are the realizations of the so-called Babson theme..."
In this position the game continued 61. b6 c1Q 62. b7 Qc5+ 63. Ka8 Qc6 64. a7. T now realized he would have had mate in two with 64. - Qh1 65. Kb8 Qh8 if not the stupid bishop had blocked the eighth rank. So he decided to get it out of the way. 64. - Be7 65. Kb8. With time running out, T had already forgotten his plan and was thinking about 65. - Bd6+, but didn't see how to continue after 66. Ka8. So instead the game went 65. - Qc7+ 66. Ka8. A few minutes later in the calm of the analysis room, he would realize not only that the back-rank mate had still been possible with 65. - Qd6+ 66. Ka8 Qd5 and 67. - Qg8, but also that after 65. - Bd6+ 66. 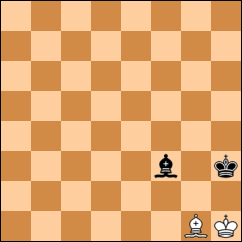 Ka8 Qa6 67. b8Q+ Bxb8, the idea that White gets yet another queen is an illusion. - "I seem to have lost on time", he confessed, but all of a sudden recalled what he had learnt in the weekend. - "No, wait, it's a draw because of insufficient material!" They were interrupted by G, the problemist. - "I'll be darned! Gentlemen..."
- "...and ladies, this moment goes to history. 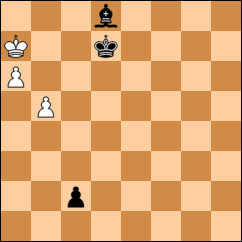 For centuries, problemists and study composers have thought that the only motives for promotion to rook or bishop are forcing or avoiding stalemate. But tonight our friend B has demonstrated, with his extraordinary 66:th move, that there is another motive: retaining sufficient material." - "In the final position, with White to move after Black overstepping time, White has sufficient material because on the forced continuation 67. 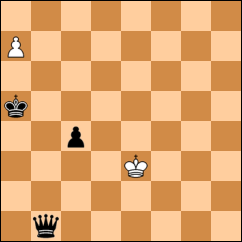 Rxc8+, Black has the legal move 67. - Kd7 after which he can in principle be checkmated. 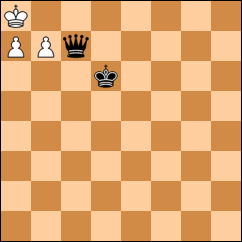 Had the rook on b8 been a queen, the only legal continuation would have been 67. 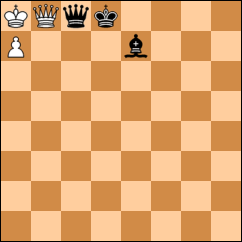 Qxc8+ Kxc8 stalemate, and therefore 66. - Kd8 would have ended the game. The manoeuver Be7 - Kd8 was brilliant too, and would have saved the game against..."
- "I don't quite follow", said B, eager to get some coffee and gossip about the other games of the evening, "but in any case the position is dead drawn, everyone can see that."